Clubnight dedicated to live club music. mix of electronic & acoustic music for the dancefloor. BECAYE AW – VOCALS & GUITAR Becaye is a guitarist, singer and songwriter of the African Fulani (Haal Pulaar) people. Becaye spent his childhood in Dakar, Senegal, and it was here he first laid his hands on a guitar. Becaye is largely self-taught. After learning elementary guitar-technique from a Serere musician, he went on to develop his own style, listening to recordings and to the radio. His African approach to guitar tuning and his way of playing the instrument result in a sound similar to the cora. Becaye began his musical career in Senegal, playing with musicians such as Baaba Maal and Mansuur Seck. He has since then participated in many groups and projects, in collaboration with a variety of musicians. JAY MIOLINHO – VOCALS, SYNTH & PIANO Jay Miolinho (José Moreira) is a singer/songwriter from Cape Verde. Currently he spends much of the year in Norway, teaching capoeira and working with his musical carriere. Jay e banda is Jay with his band of eight Norwegian professional musicians. Together, they have performed on the major musical festival in Cape Verde, as well as smaller gigs in Oslo. The music is basically taken form his latest CD – Momento certo. Jay started his musical carriere as a hip-hop artist in Portugal, with the band DaBlazz. They had a big hit with ”Rola dodo” in 2001. Jay..s first solo album, ”Só mi (Only me), was released in 2004. BECAYE, JAY & THE KOÈJU PROJECT Jay has collaborated in the Koèju project several times during the last 4 years. Together with Åsmund Skuterud he has done live club performances both in Oslo and Bergen and in the capital of Cape Verde, Praia. Additionally, 2 of the musicians in the Koèju resident band, Robin and Øystein, plays in Jay’s band and together they have been performing in major festivals in Cape Verde several times during the last year. 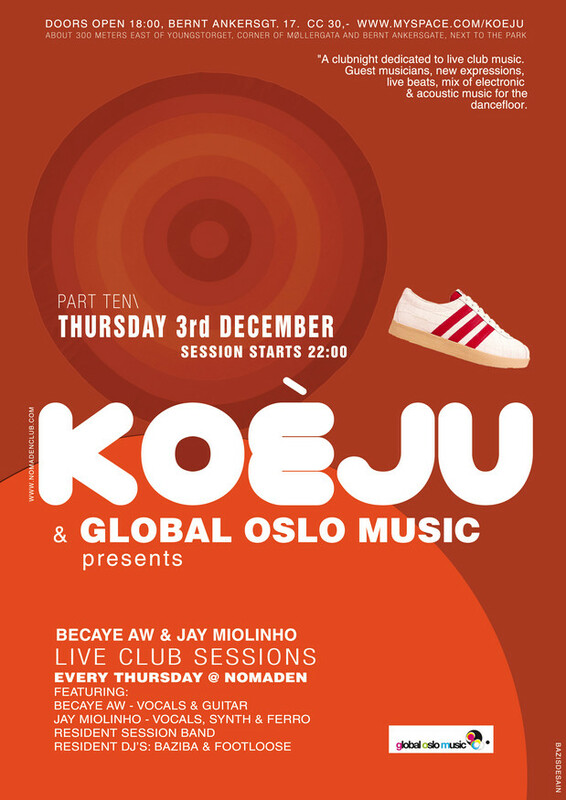 In other words, Jay is deeply linked to the Koèju project and we are very happy to have him with us this thursday, presenting some new clubmaterial and some famous “jay-remixx”. A year back Anne Grønlund made a radio documentary about “Jay e Banda” for Jungeltelegrafen på P2, and.. in the same program another great artist caught our attention, namely the singer songwriter Becaye Aw. With his latest CD called SIBI, he has been awarded with the price “Crossover artist of the year”. We have been fortunate to have him with us in Nomaden this thursday, and we are looking forward to present a highly personal and engaging versjon of club music. Som en ekte verdensborger ble hun en inspirator og aktiv deltaker i verdensmusikkmiljøet i Oslo fra begynnelsen av 1990-tallet. I 1999 startet hun arbeidet med å etablere Women’s Voice, et internasjonalt musikknettverk hvor kvinnelige utøvere fra mange land driver en gjensidig kunstnerisk utveksling. Malika Makouf Rasmussen har utgitt 2 album i eget navn, Exit Cairo i 2006 og On Club i 2008. Hun har også hatt mer enn én finger med i spillet for en rekke andre norske artisters produksjoner – både innspillinger og sceniske forestillinger, da hun har skrevet musikk, arrangert og produsert for Mari Boine, Queendom, Women’s Voice, Line Peters, Corinne Campos, Brageteatret for å nevne noen. Malika Makouf Rasmussen er som musiker inspirerende og kvalitetsbevisst, hun leverer produksjoner ingen kan være likegyldig til og som vårt mangfoldige samfunn trenger.